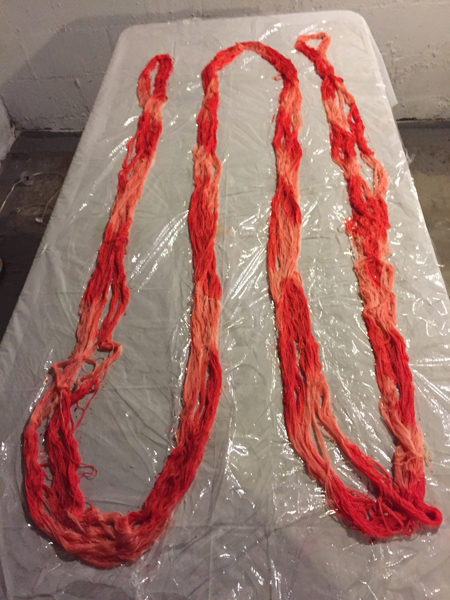 It was actually just moments after I finished the dyeing of those last warps and skeins that I decided I should have done it differently. I should have dyed some bouts only in coral and some only in turquoise. Amazingly for me, I actually had an 8/2 tencel warp measured for dyeing, dyeing I had planned to do months ago and then got too busy to get to. Wide enough for a scarf. So I just made 1 small bout of yarn the same length to use for a few narrow stripes. 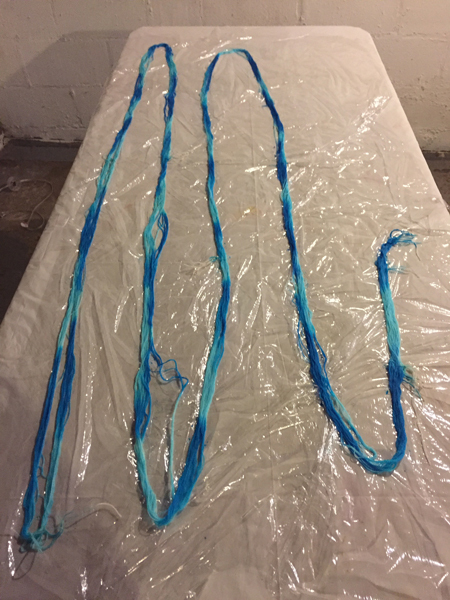 Despite being really busy this week, after playing grandma all day yesterday, I went down to the basement and dyed these 2 bouts. After seeing how the last batch dried, my goal was to make the live coral a bit more pink and a bit stronger colored. We’ll see if I succeeded. The yarns batched overnight, soaked for several hours today, rinsed till the water ran clear this afternoon, and are currently hanging to dry. I really want to get the scarf on the loom and see what I think. It’s too early to tell if I will like either or both of these dyed warps. I’ll share with you no matter what. Maybe others can learn from my experience. Sounds like you might have saved yourself from total remorse! We’ll see. Depending on how the scarves turn out, I may decide to use the warp vs. skein painted all in one warp as originally planned, or to divide them up into two or more warps.